This page displays a collection of environmental and sustainability online videos on forestry and forest ecosystems. Wood is used in a huge range of products, from building materials to paper napkins. Forests are threatened by agricultural encroachment, urban sprawl, and unsustainable logging practices. This in turn impacts our water supply and reduces the habitat available for many endangered species of plants and animals. Implementing sustainable forestry practices helps balance human needs with the conservation of natural areas and produces many long term benefits. 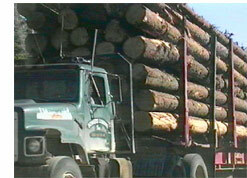 Forestry topics include sustainable logging, temperate and tropical rainforest protection, green certified lumber and wood, forest habitat threats and ecosystem protection strategies, reforestation, restoration, and tree planting, sustainable paper products, paper and wood recycling, and use of wood as a biofuel.